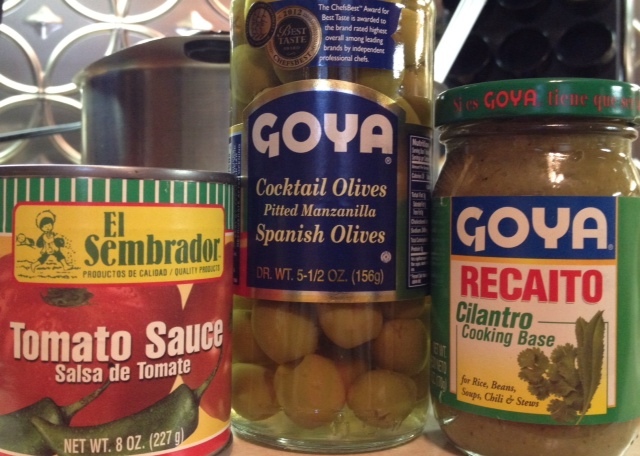 I’ve clearly been on a Dominican cuisine kick lately. 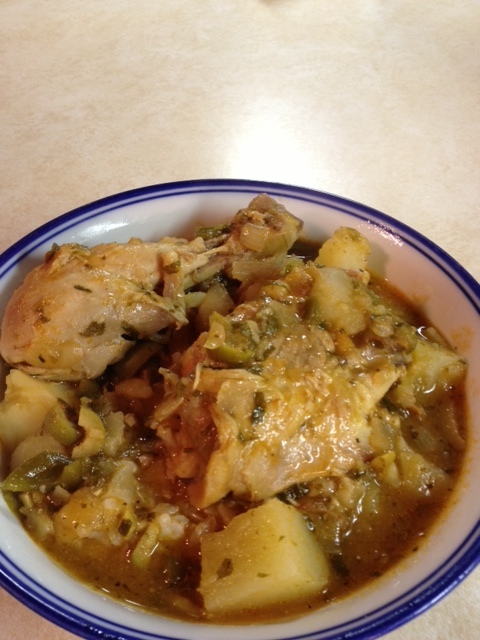 I think the cold weather is making me crave comfort food, and Dominican food is a great source of comfort to me. Physically being in the DR would also be a source of comfort, preferably on a beach with assorted rum cocktails in hand, but this dish isn’t a bad substitute (and it’s, you know, cheaper). 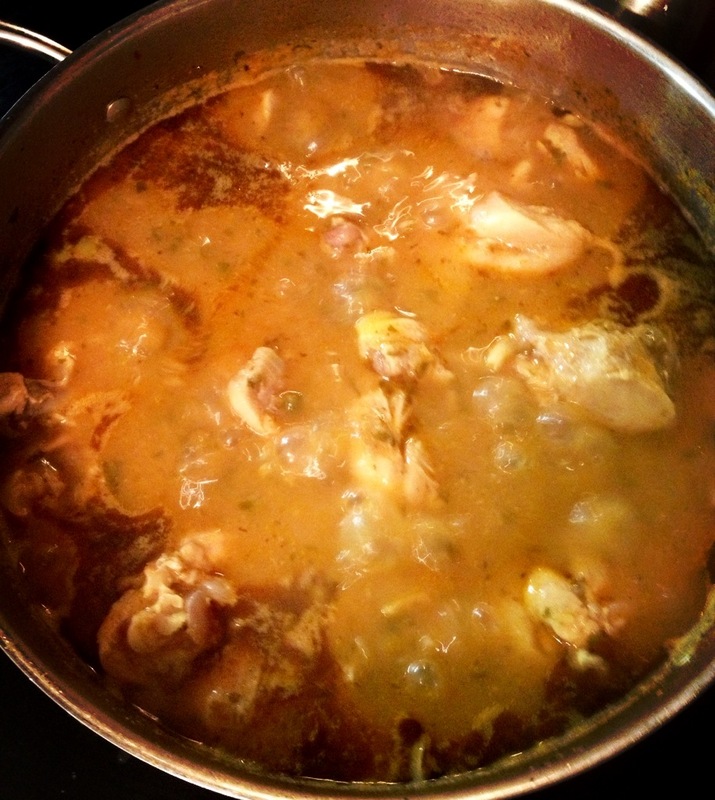 Pollo guisado is a savory stewed chicken dish that’s served over rice. As I mentioned in my first post on the cuisine of the Dominican Republic, it’s not spicy. Dominican food instead relies on aromatics like garlic, onions, mild peppers like bell peppers, cilantro, vinegar, spices like oregano, and seasonings like lime and lemon for its healthy bursts of flavor. So don’t be scurred to try it; it’s quite palatable and approachable. Also, considering the colonial history of the Dominican Republic, its food has European, African, and Taíno Indian influences, so it’s basically a trip around the world on a plate and a party in your mouth. Plantains are a staple crop, as are rice and beans. And explaining this is making me hungry, so let’s get to it. I really think you’ll love this hearty, mouth-watering dish. 4-6 lbs chicken pieces, skin removed. I recommend legs and thighs for this dish. Grab a large bowl. Cut the lime in half and rub the skinned chicken with the lime, then sprinkle with the tablespoon salt. 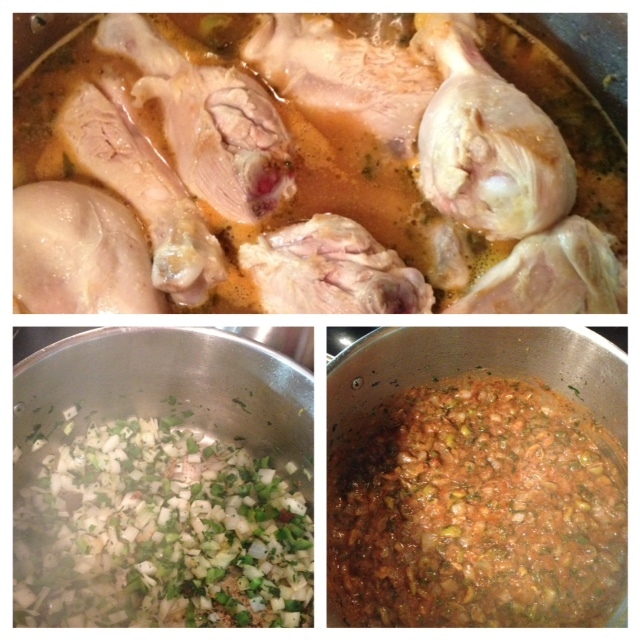 Juice the lime and pour the juice over the chicken pieces; toss to coat and let marinate for 30 minutes. You can toss this a few times while it marinates, if you’re OCD and are deeply satisfied by evenly coated chicken, like you’re ol’ pal Lauren is. “Washing” poultry with citrus juice is a Caribbean culinary mainstay; I imagine the origins have something to do with the anti microbial properties of the juice keeping the poultry fresh, but here we’re just doing it to be tasty. In the meantime, slice and dice your veggies (onion, pepper, cilantro, potatoes, carrots) and cook your rice. 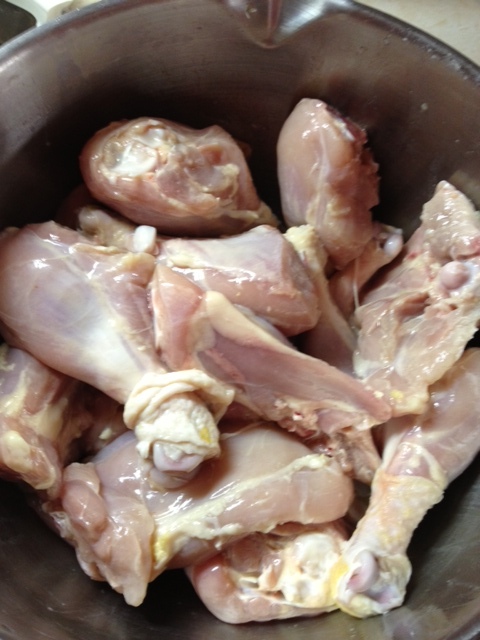 When the chicken’s ready to go, rinse the pieces with cold water and pat dry. Put on a large dish- you’ll use it again in a minute. In a large dutch oven, heat the tablespoon of oil over medium heat. Lightly brown the chicken pieces on both sides in batches, 4-5 at a time, being careful not to overcrowd the pan. Remove the chicken to the plate you so wisely left nearby. When the chicken has been browned, add the onion, green pepper, and cilantro to the pot and saute for a few minutes- you may need to add oil or lower the heat- just make sure there’s no sticking. Add the garlic powder, oregano, pepper, and recaito; cook 2-3 minutes more, stirring. Add the olives and tomato sauce, and cook for 2 more minutes. 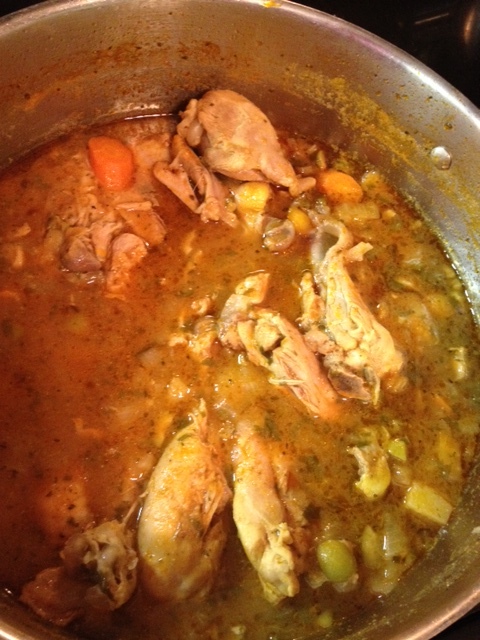 Stir in the chicken broth and vinegar, and add the chicken back to the pot along with the potatoes and carrots. Bring to a boil, then cover and reduce heat to medium low and let simmer for 40 minutes. Remove the lid and let simmer, lidless, filling up your home with the enticing promise of really good food, for another 20 minutes. That’s it! Let cool 5-10 minutes on a cool burner, and serve over rice (I opted for brown, and it was delicious). Pass hot sauce around for those who like a kick. Buen provecho!